Kasey Kahne’s No. 95 car goes through inspection at Texas Motor Speedway. Kahne was one of the drivers who didn’t get to qualify in Kansas. NASCAR teams cheat, or “bend the rules,” to say it nicely. They always have, and it’s kind of hilarious. But a “far more thorough” inspection system this year is causing all kinds of problems. Teams are mad that they keep failing, and NASCAR’s mad that teams can’t just bring legal cars. NASCAR has several inspections during and after a race weekend, including a pre-qualifying inspection. It’s caused a lot of top-level Monster Energy NASCAR Cup Series teams to miss qualifying attempts this year after failing inspection multiple times, like when 13 drivers didn’t make a qualifying lap Auto Club Speedway. That happened to six Cup Series cars at Kansas Speedway over the weekend, and pretty much nobody was happy about it. Teams were mad about how inspection went, and NASCAR’s executive vice president and chief racing development officer, Steve O’Donnell, was mad that teams were telling people they were mad. “You’ve heard me come on and say we’ve got the most talented engineers in the world working on the race cars and we believe that, and it’s certainly frustrating because it is on the teams to present their cars for inspection,” O’Donnell said. [Andrews] said the issues on the four Hendrick cars were “similar” in the area of the deck lid. Remember, this is a sport where teams have tried to slyly cover up cheats in the background of a broadcast and where fourth-place finisher Kyle Larson said in a post-race interview from Kansas that he was glad he had wreck damage because of a common cheat for this year, a caved rear window, was apparent on his car by the end of the race. “Definitely (from the damage) because I didn’t have it until after Blaney and I got together, so I’m glad to see that we have a lot of damage back there,” Larson said. “Because obviously if there was no damage, we’d probably get a penalty, and who knows we might still, but I got a ton of damage back there. Larson’s car was taken back to the NASCAR Research and Development center for further inspection. Any penalties would come out this week. Either way, penalties probably won’t change how teams approach races in the future. NASCAR teams cheat, NASCAR reacts, the teams get better at cheating, NASCAR reacts again, and everybody goes on with their lives. That’s just how this stuff works. But with even Dale Earnhardt Jr. tweeting about how penalties need to go up, something’s got to get fixed. 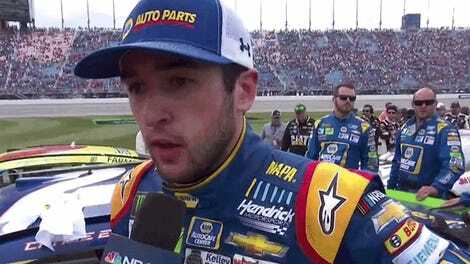 Cheating is supposed to be the fun, interesting part of NASCAR. What’s going on? Update, May 16 at 8:41 a.m. Larson’s team got a penalty, his crew chief a $50,000 fine, and his car chief a two-race suspension in points races. Larson also lost the stage point he won in Kansas, and NASCAR docked him 20 points in the owner and driver standings.